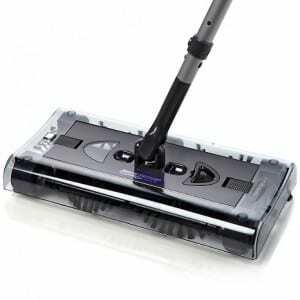 Swivel Sweeper Max Review – Can This New Model Outdo the Previous One? The Swivel Sweeper Max is a follow-up to the enormously popular Swivel Sweeper, and boasts some upgrades that are supposed to entice you to make a new purchase at a larger price point than the original. So let’s see if these new features are worth buying into. It’s hard to deny that the Swivel Sweeper made plenty of inroads into millions of homes across the country, becoming the preferred way to sweep up the house, and proving to be more efficient than using a broom in many instances. The reason it tends to outdo a broom is because you’re not just moving dirt and debris around the floor, you’re picking it up on the first pass. The main claim by the makers of the Swivel Sweeper is that it’s easy to use, lightweight, can swivel in any direction, glides over surfaces smoothly, changes surfaces without a problem, is easily emptied, and lasts for 45 minutes on one charge, is cordless and portable, and is not sold in stores. The hype is that this is essentially still just a sweeper, but it’s being marketed by a company that has already had great success bringing the original Sweeper to market, so they know exactly how to advertise this in a way that gets you to want it. The Swivel Sweeper Max is sold on the official website for $55 and it’s broken down like this: It starts off at a base price of two payments of $20, plus $15 shipping, and you end up getting two full sized sweepers, and two mini handheld sweepers. Since you’re getting two of them, the price is right if you split it in half, as other sweepers with comparable features are in this price category, and most of them don’t come with a mini sweeper as well. This is supposed to make your life easier when it comes to cleaning up all sorts of messes around the home. It can pick up pet hair, human hair, and any sort of dry debris on the ground. It’s not designed to pick up wet messes and spills, so you’ll want a Hurrican mop or something similar for those kinds of messes. The Swivel Sweeper Max is a product that you can tell they spent time on thinking of how to make it better. The way you can empty it without touching anything, the way you can remove built up hair from the brushes easily and without a tangled struggle are both great features. They’ve also managed to keep this lightweight, so you don’t end up lugging around a big heavy vacuum when you just need to clean up a small mess. And you can use this up and down stairs without throwing your back out. When it comes to buying a sweeper you have to know what all of your options are. You can buy one that doesn’t have any power to it, but then you’re relying on the brushes to do all the pickup work. You can get one that’s corded, but then you’re going to have to deal with the problems of a corded sweeper, which will be a lot like a corded vacuum cleaner. There are also sweepers out there that are heavier, so you have to deal with that heaviness as you move about your home. The original Swivel Sweeper got somewhat mixed reviews, with many users saying that it worked great, and is lightweight, and others saying that the battery didn’t last long enough. Keep in mind that this Max model has many similar features as the original, so there’s a chance that they’ve made some improvement on this, and also there’s a chance that it could have some of the same problems as the first one. Overall, the Swivel Sweeper Max is getting our Solid Try rating. It has enough features that make it worth getting if you have an older model of sweeper, and makes a great first time purchase if you’ve never bought a sweeper before. We like how the roller brushes are removable so you can take them out, get all the hair off of them easily, snap them back in and it works just like new. This sweeper has a lot going for it, and if you don’t have something like this already, you may want to pick this up. Have a friend go in on it with you since you won’t likely need two of them. At the $27.50 price point you are going to end up with a good sweeper, and a mini sweeper for small messes, all delivered to you. That’s not a bad deal, considering you have 60 days to try it out and see how you like it. What do you think? Does the Swivel Sweeper Max work or not? I have purchased the Swivel Sweeper Max and would give it a recommendation with reservations. On the positive side, the battery holds its charge for the promised time and the level of power does not wane noticeably over the span of time. The sweeper is light, low profile and pivots so it can get under furniture and around obstacles with little effort. The fact that there are side brushes make it good for corners, it gets close to baseboards and finally the sweeper is easy to empty. Now the negatives: the Swivel Sweeper operates on a combination of brushes and a vacuum suction. The suction is negligible and has little benefit- after all, how can an effective vacuum apparatus fit is so small and flat a body. As a result of inadequate suction, the brushes are as likely to bounce debris away from the sweeper as they are to brush it into the sweeper’s dirt chamber. A single bird seed, small pebble or tiny bead will be expelled away from the sweeper by the rotation of the brushes and may require multiple passes to be “captured”. I’ve “chased” a single seed around the room for so long that it was simply easier to go get the hand- held suction vacuum to get it. The sweeper cannot deflect rug fringes and will completely seize-up if you accidentally pass over a fringe. Also, long hairs, threads, floss and certain houseplant fibers get tangled into the spool of the brushes predictably and without exception. The manufacturer suggests that this is easily remedied- it is not- the process is distasteful and dirty as one digs away at the spools trying to unfurl stubbornly fixed hair and threads that have by that point drawn-in dust balls and other debris. The Swivel Sweeper works best for short touch-up cleaning on mostly clean carpets and floors it is effective in grabbing “dust bunnies” pine needles, leaf material and small amounts of soil. It cannot however manage seeds, pebbles, coffee grounds, long hair, threads or similar materials. Trying to get a part for this. Trying to get a short brush for the side of it. Cats got to a brush on this and chewed it all up. So, I called 1-888-904-9090. The line is always busy. I’ve owned the original Swivel Sweeper, the Swivel Sweeper II. They are a gift from God for those of us who suffer from advanced Osteoarthritis. I’m buying the new Swivel Sweeper Max because although they only have about a 2 year lifespan, for the lack of pain I suffer for what I use them for (linoleum floors, hard to reach areas with the regular upright vacuum and floor mats) it is WELL worth the money. And, they are strong enough to clean the dust off my Berber Loop carpets in the hard to reach areas. Anyone who knows me, knows I want to do for myself as long as possible and how much I take pride in taking care of what the Lord has provided. I give it a 5 out of 5 Star rating for performance for arthritis sufferers.